Nobel Peace Prize winner Aung San Suu Kyi completed a remarkable journey this week, when her National League for Democracy won a sweeping victory in Myanmar’s first elections in 25 years. Suu Kyi—the daughter of the assassinated Aung Song, who led the country (also known as Burma) to independence from Britain in 1948—was detained under house arrest for years by the country’s authoritarian military, and has worked for decades to bring democracy to her people against long odds and considerable personal hardship. But now, as the saying goes, the real work begins. Despite the NLD having a huge parliamentary majority, Myanmar’s generals wrote themselves an insurance policy in the country’s constitution, guaranteeing the military a 25% voting stake. The generals also dominate the country’s bureaucracy and large chunks of the economy. The constitution also has a clause that was specifically constructed to bar Suu Kyi from serving as president—though she has said she will serve “above” the president. 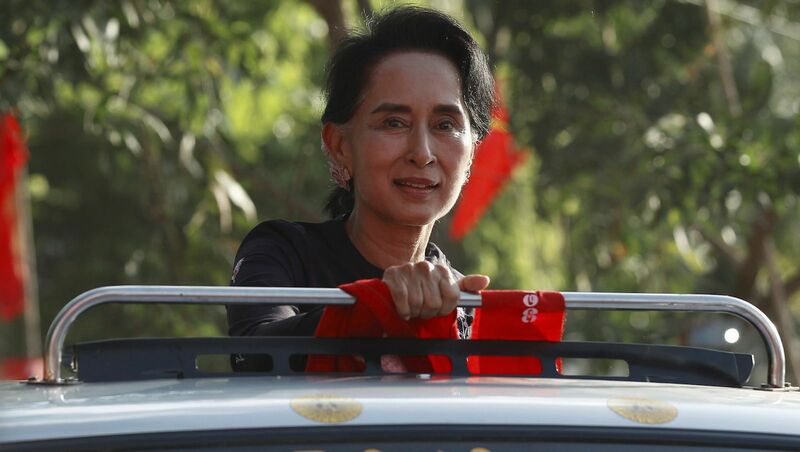 Perhaps that is only just, considering her revered status in Myanmar, her crucial role in leading the country out of years of self-imposed isolation, and her party’s overwhelming support in this week’s elections. But it also betrays something of an imperious streak in Suu Kyi, who will have to govern under the weight of decades of expectations while also attempting to balance her dual status as a politician and revered human rights activist. The stickiest issue by far is the status of the Rohingya, an oppressed Muslim ethnic minority who have been brutally persecuted in Myanmar, with the active involvement of Buddhist monks and government security forces. The Rohingya, subject to widespread mob violence, have been herded into camps, where many have attempted to flee to neighboring countries—triggering a refugee crisis throughout Southeast Asia that mirrors the plight of Syrians trying to reach Europe. Suu Kyi has been noticeably silent on the Rohingya’s plight—inexcusable for a Nobel Peace Prize winner, but all too understandable, if lamentable, for a politician vying for votes in a mostly Buddhist country where the Rohingya are reviled. For any politician, the challenges facing Myanmar are daunting: The country is experiencing a land rush as multinationals flood into one of the last big undeveloped economies in southeast Asia, and the country is still fighting a number of insurgencies from ethnic militias. The country is also sandwiched between India and Thailand, which both congratulated Suu Kyi on her election win, and China, which pointedly did not. The contrasts between those neighbors—a vibrant but messy democracy, a democracy-turned-military dictatorship, and a monolithic one-party authoritarian state, respectively—shows the vast range of outcomes that Myanmar will have to navigate in the years to come.